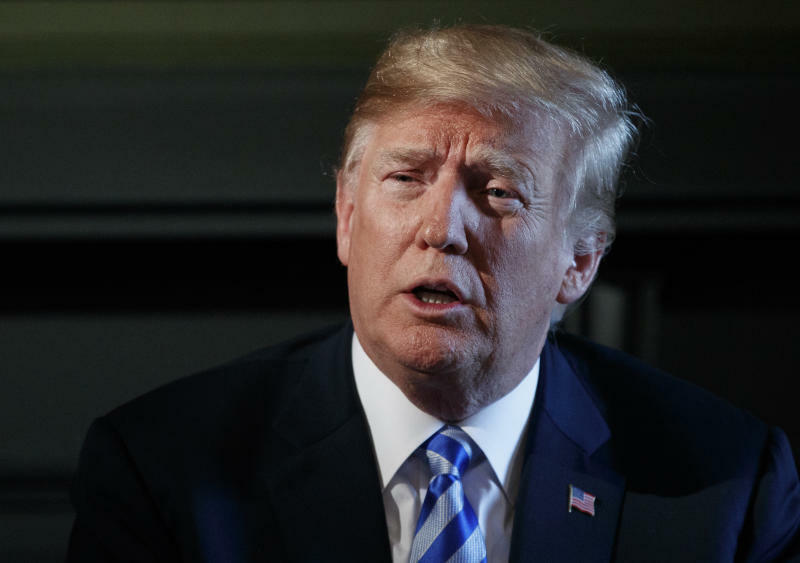 WASHINGTON (AP) -- President Donald Trump is pulling numbers out of thin air when it comes to the economy, jobs and the deficit. He refers to a current record-breaking gross domestic product for the U.S. where none exists and predicts a blockbuster 5 percent annual growth rate in the current quarter that hardly any economist sees. Hailing his trade policies in spite of fears of damage from the escalating trade disputes he's provoked, Trump also falsely declares that his tariffs on foreign goods will help erase $21 trillion in national debt. The numbers don't even come close. The statements capped a week of grandiose and erroneous claims by Trump and his critics, including questionable rhetoric from Sen. Bernie Sanders that his "Medicare for all" plan would reduce U.S. health spending by $2 trillion. TRUMP: "Economic growth, last quarter, hit the 4.1. We anticipate this next quarter to be — this is just an estimate, but already they're saying it could be in the fives." — remarks Tuesday before a group of business executives. TRUMP: "Great financial numbers being announced on an almost daily basis. Economy has never been better, jobs at best point in history." — tweet Monday. TRUMP: "Because of Tariffs we will be able to start paying down large amounts of the $21 Trillion in debt that has been accumulated, much by the Obama Administration, while at the same time reducing taxes for our people." — tweet Sunday. WHITE HOUSE: "More than 2.8 million have stopped participating in the Supplemental Nutritional Assistance Program (SNAP) - commonly known as food stamps - since Trump's first full month in office." — information sheet released Tuesday, citing Fox Business report. THE FACTS: Trump and the White House omit important context and overstate his role in reducing the number of people on food stamps. Nor is it accurate that recent declines are the biggest in decades. It's true, as the White House conveys, that more than 2.8 million people stopped participating in the program during the 15-month period from February 2017, Trump's first full month in office, to May 2018, the latest Agriculture Department data available. But this decline is consistent with a longer-term downward trend in food stamp usage due to an improving economy. Currently there are 39.3 million people in the program; food stamp usage peaked in 2013 at around 47.6 million, following the recession. The study from the Mercatus Center at George Mason University in Virginia also concluded that "Medicare for all" is unlikely to produce a dividend for U.S. society in the form of lower total health care spending. To get that result would require paying hospitals and doctors much less than they get now and risk putting some out of business. The study found that if hospitals and doctors were willing to accept Medicare-based payments of 40 percent less for patients who currently have private insurance, then projected U.S. health care spending would decline by about 3 percent from 2022-2031, or $2.05 trillion. It's a big asterisk, and one that Sanders fails to disclose. But the study also said if medical providers continue to be paid about the same as now, U.S. health care spending would increase by $3.25 trillion over 10 years under "Medicare for all." It works out to about 5 percent more. TRUMP: "California wildfires are being magnified & made so much worse by the bad environmental laws which aren't allowing massive amounts of readily available water to be properly utilized. It is being diverted into the Pacific Ocean." — tweet Monday. TRUMP: "Governor Jerry Brown must allow the Free Flow of the vast amounts of water coming from the North and foolishly being diverted into the Pacific Ocean. Can be used for fires, farming and everything else. Think of California with plenty of Water - Nice! Fast Federal govt. approvals." — tweet Monday.